3RD ROW SEATING! ONE OWNER! HEATED FRONT/REAR SEATS, LEATHER SEATS, NAVIGATION/GPS SYSTEM, BACKUP CAMERA, BLIND SPOT SENSOR, HEADS UP DISPLAY (HUD), OUTSIDE TEMPERATURE DISPLAY, RAIN SENSING WIPERS, REAR WINDOW DEFROSTER, TRIP COMPUTER, BLUETOOTH HANDSFREE, STEERING WHEEL MOUNTED AUDIO CONTROLS, REMOTE KEYLESS ENTRY, BRAKE ASSIST, TRACTION CONTROL, SECURITY SYSTEM, HEATED STEERING WHEEL, AIR CONDITIONING, AND MORE! This gorgeous white CX-9 is unmatched by any other vehicle today! This signature model comes with only the best features, the best powertrain, and the best driving feeling. This is the perfect car for any family in need of space, durability, and comfort. The versatility is wide, the condition is pristine, and the priced at $43,700. What are you even waiting for? Come down to Gyro and experience a test drive, any of our knowledgeable product advisors would be more than happy to help you. 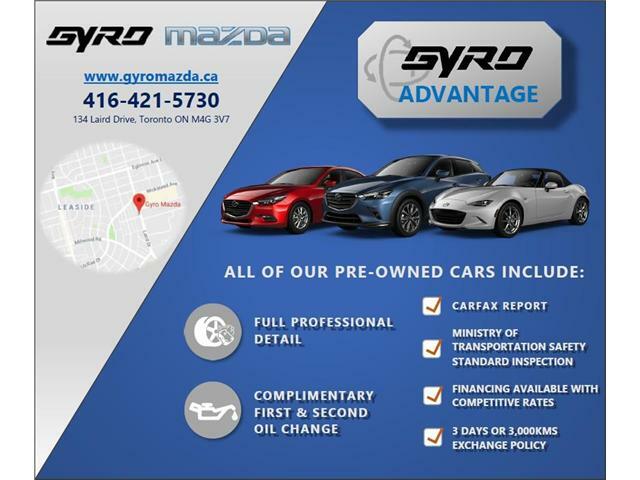 Located at 134 Laird Drive, Gyro Mazda is the oldest dealership in Toronto, established in 1971. We are now in our second generation of family ownership. Our Higher Purpose is to promote, enhance, and develop our relations with one another. Specifically with our Team, Clients, Community, and the General Public.